The November/December 2016 edition of the Carolina Alumni Review features Nick Mueller’s labor of love: the National World War II Museum. After earning his master’s degree in history in 1964 and his doctorate in 1970, both from Carolina, Mueller embarked on a teaching career, inspired by a summer’s study of European culture and history with his professor father. He met the author Stephen Ambrose when they were colleagues at a satellite campus of Louisiana State University in New Orleans. After the two started talking about the immense impact of the outcome of World War II on both continents, they hatched the idea for a modest museum, covering just the Normandy invasions. That idea grew, with help from key members of the U.S. Senate, into the country’s official museum of the war. What Mueller and Ambrose got done — after several false starts — now covers six acres in a reviving warehouse district in New Orleans and is TripAdvisor’s No. 1 attraction in the city. You can explore the museum here via its extensive website. 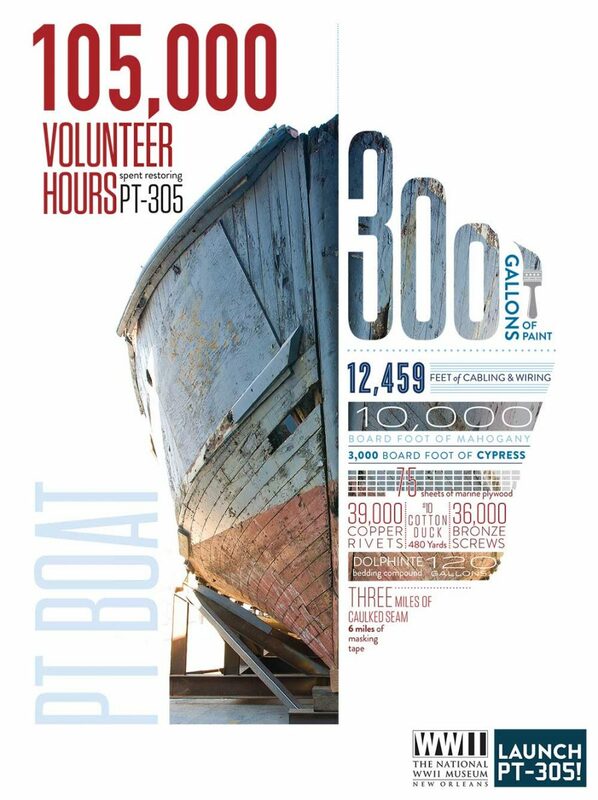 See the PT-305 all-volunteer boat restoration at the Kushner Restoration Pavilion at the National WWII Museum in New Orleans. One hundred ninety-nine Patrol Torpedo boats were built by the Higgins plant in New Orleans during World War II. Only five of those boats remain in the U.S. Beyond All Boundaries, showing exclusively in the National WWII Museum’s Solomon Victory Theater, is a 4-D journey through the war that changed the world. Witness the assembly and hanging of six WWII-era aircraft, all in under six minutes at the National WWII Museum's US Freedom Pavilion: The Boeing Center. You will see a North American B-25 Mitchell, a Boeing B-17 Flying Fortress, a General Motors TBM Avenger, a Chance Vought F4U Corsair, a Douglas SBD Dauntless and a North American Aviation P-51 Mustang.